It’s not a secret that we weren’t really into any of the Positive Grid products prior to Bias Amp FX 2. We have a few reviews here that showed our mixed feelings on Bias Amp 2 and Bias Pedal. So when we connected with Positive Grid on this product initially, I really wasn’t sure what to expect. If you aren’t familiar with the Positive Grid products, you might have been living under a rock because I feel like their marketing team has made literally every guitarist on earth aware that Positive Grid products are out there. The plugin in question here is Bias FX 2. It’s a full amp suite with a completely nuts collection of gear. You get pre, post, amps, pedals, cabs and plenty of features to keep anyone busy for a while. The graphics are much improved even though they have always been solid. Positive Grid products always look beyond great and they also seem to always have a useful, easy GUI that makes traversing the mountains of gear as easy as it can be. It’s exceptionally easy to plug in and be playing with a solid tone within seconds. Bias FX 2 has a very nice workflow for songwriting and just jamming out ideas or quick demos without needing to put work into your tones. The clean and low gain amps are pretty much all very pleasing, warm and detailed. These are the stars of the show in my opinion. There’s been a world of improvement in this department. Improvements you can really hear from the first notes. The note response and articulation have come worlds, the sustain and resonance have improved tenfold and I had a great time with the entire collection of amps and components in this area. Add in some reverb, delay or modulation and you can create everything from chorus laden blues to ambient tones washed with elegant delays. Thumbs way way up here. Moving from low to mid gain I start hearing a drop in all the things I was really enjoying about the plugin. As I increased the gain, the warmth dissipated, the detail and realism in the amps started to get dull. That said, the mid to hi-gain amps are much better than the last Bias FX but there are elements and frequencies brought into play as the gain increases. These added factors are difficult to remove without taking even more quality from the tone. It’s not a secret that Positive Grid products have struggled with hi-gain in the past and while the plugin has improved in a lot of areas, the hi-gain amps and components don’t offer the same level of improvement. They will do fine for, practicing, quick demos and laying down riffs or ideas but I wouldn’t suggest it for recording hi-gain tracks. It’s not that it’s the worst hi-gain ever but when you have so many really solid plugins out there capable of incredible hi-gain tones available FREE like the Ignite Amps or AXP / Softamp plugins, it just doesn’t make sense for me to use Bias FX 2 for such applications. The pedal selection is monstrous. You get more than a little bit of everything. Tons and tons of stomp boxes ranging from some of the most popular in history to in-house creations inspired by a wide range of genres and styles. I went through ever stomp and the consensus is about the same as it was with the last Bias FX. The delays, reverbs, modulation and dynamic components are effective for the most part but the boost and distortion effects just don’t have a lot of realism or feel to them. That’s not to say you can’t find some decent crunch tones in dirty cleans with some of the boost and distortion pedals. I was able to get several but it took some work and that sort of defeats the plug and play approach Bias FX 2 is meant for. With full amp suites, you should have mix ready tones available without a whole lot of tweaking. Some of the components do require some finesse to tame. Going back to the delays, verbs, modulation and other pedals outside of the boost/dist group, there’s a lot to play with and most of it will at least give you a few of the characteristics that defines the gear being modeled. We had a lot of issues with the impulse loader at first but for the most part it was fixed during the plugin’s first update. If you are having issues with it and have not installed the update, doing so should solve your problems. When I bypassed the internal impulse loader and cabinet section for my own, the level of detail and bass response did change for the better but the internal loader isn’t bad by any means. When you bypass the cabinet section of any full amp suite, remember to bypass the post-fx you have in your preset because the post FX will now be hitting the impulse loader. Always watch your signal chain. When I started matching the Bias FX 2 amps with impulses from my collection in the, I found the amps matched up really well with a lot of impulses. The cleaner amps really came to life with a variety of 212 open back impulses. There’s a large spread of pre and post effects that can be used for EQ, filtering, beefing things up and more. There’s a lot in here and again, I am wondering about the quality over quantity factor. I am not entirely sure all of this gear was necessary all in one shot. There’s a fair % of components that feel a bit like a shell for what is at times an over simplified and condensed version of the gear being modeled. I would imagine that over time, many bugs will be squashed but for now, some of the components just miss the mark. The first feature I tried was the guitar match. 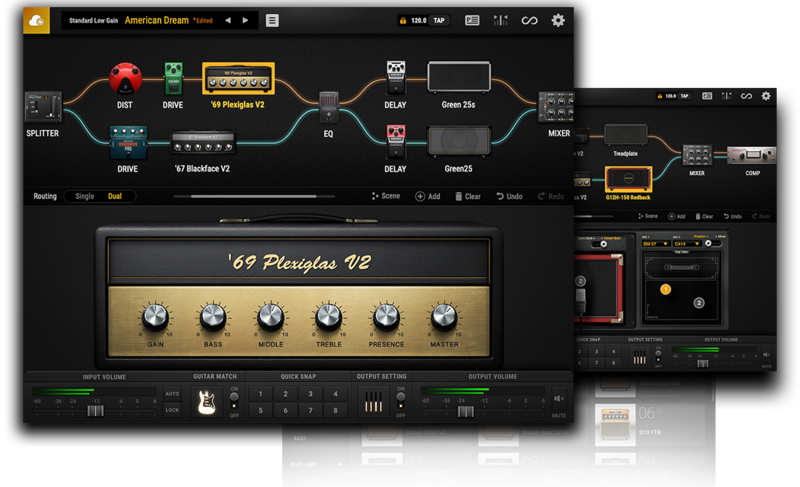 This feature takes your signal and adds characteristics via filters / eq etc from a list of classic and modern guitars. Let’s not take this too seriously ok? Does this feature turn a $300 guitar with stock pickups into a $4000 Ernie Ball? No, it doesn’t but it can give the illusion of different pickups if the pickups you are using have quality. If you are using cheap pickups, the emulation will only be as good as your pickups but if you are using better pickups, the pickup and guitar emulations will improve as a result. The guitar match can turn a decent humbucker into a single coil or P90 with reasonable results. There are other programs that do this better but it’s a nice addition to this suite. Don’t expect too much here and you will enjoy it but if you are expecting pristine telecaster tones from a lower quality humbucker, you are asking too much. A nice touch feature is the input regulation where the plugin will give you the perfect input. This ensures that all of the components are getting the right amount of signal to perform as planned. It’s not just an input adjustment for the user as much as the plugin just automates to optimal levels. You can do it manually but for those that are unaware of how the input works and affects the tone. This is a great tool for those that want to plug and play without worrying about the small stuff. If you are looking for a fun program for recording on the go, quick demos, songwriting and other more recreational applications, Bias FX 2 certainly has everything anyone could ever want or need for all of the above. On the other side, if you are looking for a professional quality guitar plugin, the clean to low gains and other parts of Bias FX 2 are more than capable but the hi-gain capabilities are limited. Bias FX 2 has been vastly improved from the first edition. The cleans, low gain tones, delays, reverbs and many other things about it are just flat out better without question. The warmth, detail, note response and many other areas of the plugin have a level of quality that I didn’t hear in the earlier Positive Grid offerings. I have always been a quality over quantity type person and while Bias FX 2 has some exceedingly useful components, there’s a much larger percentage of the components that I just didn’t feel really brought anything to the table. I would have preferred less gear with a stronger quality across the plugin. There’s a selection of components in here that just don’t make the cut. Cool graphics with nothing inside but otherwise, you will likely find many of the components give you at least the illusion of the gear that inspired them. The lack of realistic and usable mid to high gain tones is really going to hurt the plugin’s popularity in my opinion because let’s be honest, the market revolves around hi-gain at the moment so not having any really good quality higher gain options could be a downside for many potential buyers. Positive Grid obviously have a collection of talented individuals in their development department and it’s only a matter of time before they lock into mid to hi-gain and really complete their arsenal. There’s no denying the quality of the GUI and really just the pleasing looks and ease of use across the entire plugin. I mean the entire thing looks incredible and I will also note the long list of improvements in the clean/grit/low gain areas of the plugin. I love when you can really hear the progress in a plugin and these areas show the hard work put in.